Ideal for fast, easy driving of nuts, bolts and hex head screws. The non-magnetic chip ring holds the fastener securely without causing chip build-up. 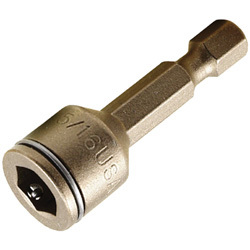 Rugged, single piece construction provides long life under constant heavy duty use, and the precision formed tip ensures a proper fit.